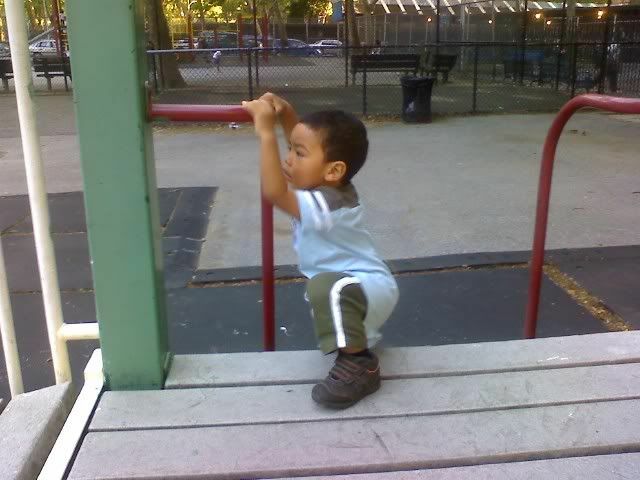 I'm not sure when it came into your little head that you could be a mini daredevil. I certainly didn't mention it to you or encourge any daredevil like actions. Yet there you are trying to test the limits of your balance and strengh. I should also mention your testing the limits of my nerves. I'm starting to be a nervous wreck! As I stand watching you, I see your moments of plotting to do a mini daredevil trick. I see you eyeing the top of the bigger slide wondering how to get up there. I see you eyeing the bigger swings wondering if you can make a dash towards it before I catch you. As you make these decesion to climb down, up and all around the big areas, your determined to do it alone. No help from mommy is needed. I'm amazed at you and your actions...and your inistance, in the form of wiggling and running away, that I leave you alone. What are you thinking about when you take that step off the edge? I hold my breath for the fall and crying...but they dont come. You take the step, hang there for a few seconds and then you're down. Even after a stumble, fall or scrape you're right back trying to perfect your system of tricks. With each sucessful daredevil action you proudly smile and clap to yourself. In support, I clap and smile also at your success. But I also hold back a few tears at yet another system of actions taking you futher away from being my baby and closer to being an independant little boy. 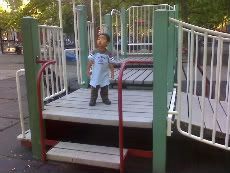 Today I planned to start my day early and spend most of it at the playground. I packed our lunch, snacks and some toys which included a ball that I discovered during a toy preview blog event. I was excited to test the ball out with Daniel. 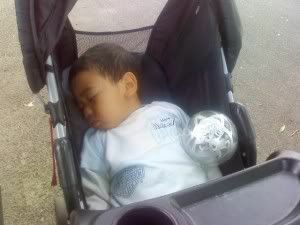 Sadly during our walk to the park Daniel decide he wanted to take his nap a bit earlier then usual. As I watched my son nod off I decide to continue to the park and just enjoy some "me" time. 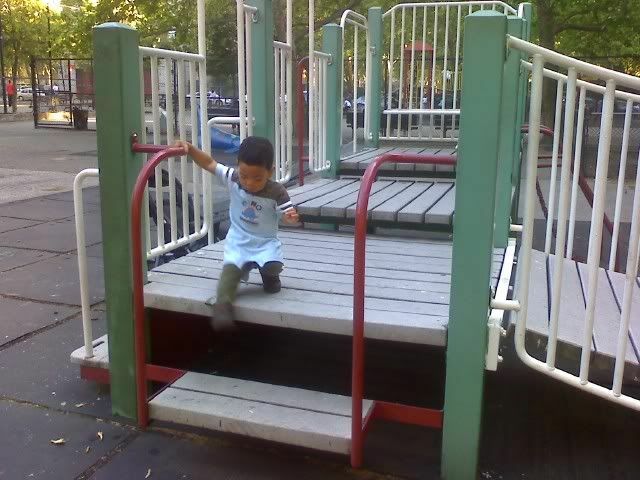 Once at the park I found a nice bench, parked the stroller next to me and started the zoning out process. Since it was early in the day only a handful of people strolled by. Most people I just ignored until I saw a flash of anime colored red hair framing a honey brown face. Nosey me: Excuse me but are you mixed with Asian? Red Hair: Yes, I'm mixed with Korean and Black. Nosey me: You are! That's interesting because so is my son. Next thing you know, two strangers are bonding over the Korean and black connection. I learned that Stef was born in Korean but adopted by a black family and raised in America. While she does know some things about her half Korean history, she mostly identifies as being black. 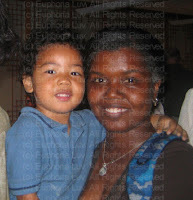 Stef is also a mother and like Daniel her son came out looking more Korean event though his father was a black man. We joked that the Korean gene sure is strong. She shared that her son, who is grown, denies his Asian heritage. Her son also identifies as being black despite he's strong Asian features. Oddly enough he was also born with reddish hair and had dyed it black since he was a child. She's tried to help him accept himself. She explained that no matter what we as moms do, in the end it's up to them to choose who to be. We also talked about the men in our lives but most of that is personal so I wont share it here. But one thing we agreed on is we miss the old fashion type of men. The men like Dr. Martin Luther King who grew up knowing how be men of action. Men these days have lost something and it's sad not just for women seeking partners but for our son seeking role models. As we talked Daniel woke from his nap and wondered who the strange lady with the red hair was. As I made the introductions I noticed Stef's reaction to "seeing" Daniel. It's a reaction I've seen before when Daniel first met Sheila, who's also korean and black. But I suspect it's a reaction any blasian will have when meeting another blasian. It's one of recognition, one of "I know you because you are me" and ultimatly one of "I'm not the only one". It's an intereting reaction and one I'll talk/explsore/obesse more about in another blog. 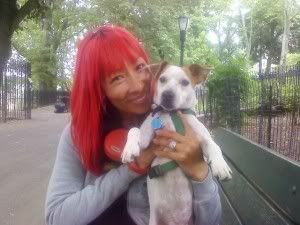 For now I was happy I went to the park today and met this blasian stranger. 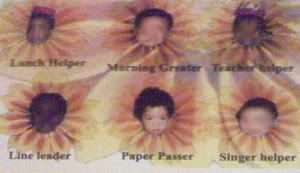 At daycare there's a poster showing what each child helps doing. As my son grows apparently so will his accidents. Try as I might I can't prevent him from having no accidents, so I try to prepare myself and cope as best I can when they do happen. Still the latest round of boo boo's has me wondering what is it with little boys and accidents? Tonight's boo boo is a big one since it's on my son's head. As usual he was trying to climb on things he shouldn't. As I once again ask him not to climb in a certain area, he slides off and connects with a wall corner. As he walks over to me wailing I start the panicked mother inspection process. I'm looking for the sign that will immediately launch me into heading into the emergency. 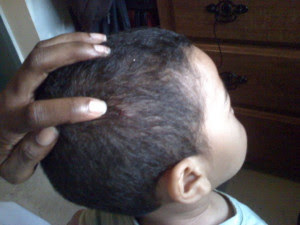 Oddly enough, while there is a small gash on the side of my son's head, there's no bleeding, swelling, or disorientation. Matter of fact he's stop crying and is trying to escape my grasp so he could go play. When I finally release him, I immediately text me sister the EMT to find out what to do. That crazy girl tells me to take a photo and send it to her. *groan* I can just see the scene of her being at a hospital, asking a doctor for their opinion, and then all the medical staff standing around her discussing my photo. Just think...this is just the beginning. As he grows, like many young boys, he's going to try all sorts of crazy stunts. Of course this will mean more accidents and in some cases some bad ones. I wonder if there's a support group for Mother's of a little boys who gets boo boo's. There should be! 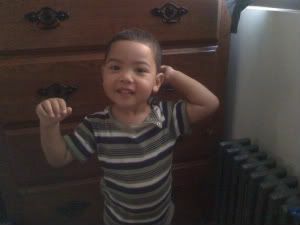 Daniel has now started saying "cheese" while posing to take a photo. This mothers day was a quiet one for us. We're not feeling so well so we decided to stay home and rest. Some might feel I'm missing out on the Mother's Day activities but for me I've already done enough things leading up today. 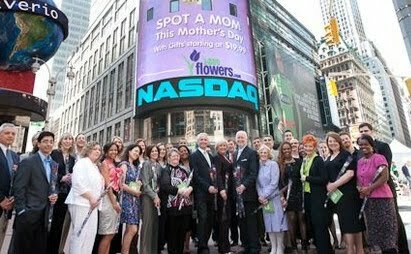 One of the best things I did was once again helping 1800flowers.com ring the opening bell at NASDAQ in Times Square to officially usher in Mother's Day. True I did is last year also but it was such a different experience. Last year I was excited to ring the bell as a mom blogger but that was just in one dimension. As I stood there I just representing myself. Plus at the time I was in favor with alot of people. But this year as some might know, I've had some drama and fell from grace with some people. Honestly, when I saw the invite I was a bit surprised to be asked. Ringing the opening bell at NASDAQ is a very visible action. The bell ringing ceremony is broadcasting outside on the building but also televised and photographed. So this year as I stood there I thought about what my image meant to anyone seeing me. Yes my image gave presence to the black mothers, to the mother's of a biracial child, to the single mother, etc. But it also gave an image to women who stand to make a difference...sometimes alone... for what they personally believe in. To me being a mother is not just about having a child. Many women are "mother" figures or have taken on a "motherly" role for others. So many women have been "mothers" to me and I hope I have "mothered" younger women. As the camera's flashed and we clapped and cheered, I hoped any women, young or old, who saw me would be inspired to follow her calling and listen to her heart. As anyone can see, doing so has given me amazing life experiences. Happy Mother's Day to all Women! I'm so excited! A few days ago I received an invite to a birthday party for our hapa friend W. This is Daniel first birthday party invite! 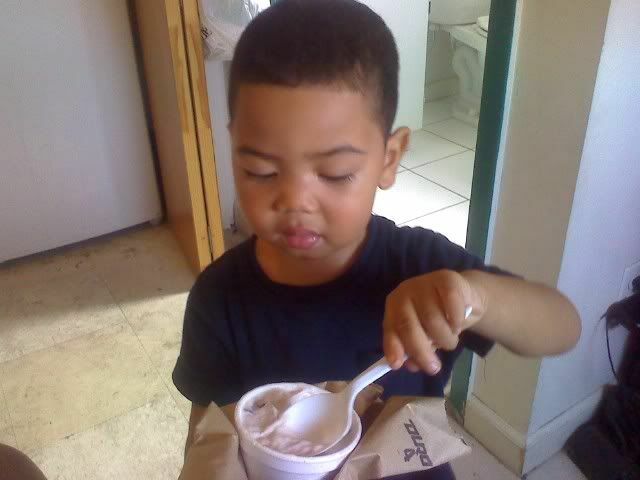 We're happy it's for a friends since we use to have play dates with him and his mom (who's blasian). These days work and life has kept us from hanging out with them lately. But with this party we'll get a chance to catch up. Plus I'll get to meet the new hapa addition to their family...a baby girl! The party was outside in the playground so finding it wasn't hard. 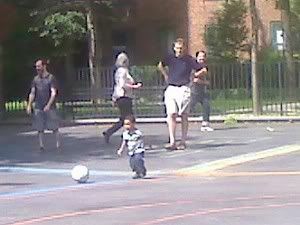 Once there Daniel took off to play with the other kids and I went to socialize. I saw the new baby and of course she's adorable. I met W's grandma who's Korean (sweet lady) and chuckled with W's mom that she was allowed out of the house. It's a Korean (Asian) thing that women who recently gave birth shouldn't go outside with the baby for months. Then I met a few of the other parents at the party. One mom in particular, a white women with a black little girl, caught my eye and after sneaking glances at each other we finally chatted. I asked if had a domestic adoption but she explained her daughter is from Africa. She didn't ask if I adopted but she did mention feeling like she saw me (us) somewhere before. I joked we're all over the internet so maybe she did. 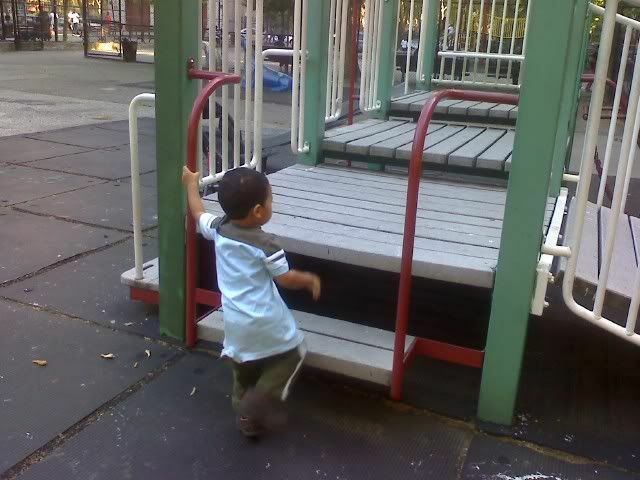 I then went in search of Daniel who was running wild around the play ground. It took some chasing after him but I caught him and settled him down with some pizza and juice. After our snack I started a game of soccer with him. I'd kick the ball while he tried to grab it. I guess our game looked fun cause W's dad joined us to play. We kicked the ball back and forth chatting about life with a new baby and all that while Daniel got a serious workout...trying to catch the ball. Eventually the party ended and we got ready to go. 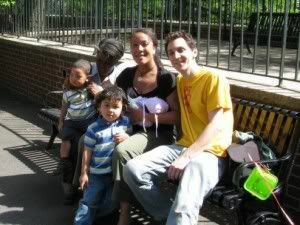 As we packed up I thought how wonderful to spend time with friends as a normal mixed race family enjoying the day. Nearly everyone at the party was interracial/mixed race with biracial kids so I didn't feel like I was standing out. Daniel and I blended right in which is a welcome and happy feeling. Today Daniel and I met grandma for breakfast in honor of Mother's Day. Well at least in my mind that why we met. 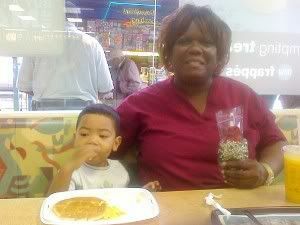 In truth Daniel just wanted breakfast, my mother just wanted to see Daniel and I just wanted an easy way out of doing something for my mom for Mother's Day. Hey I'm being honest. As I looked over at Daniel I wondered if in a few years when he takes me out for breakfast for Mother's Day... will I nag him also? 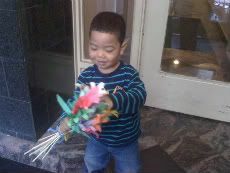 Eventually I pried the flowers from his little hands so I can OH and AH over them. Even though they were made out of paper and crafting sticks, they we're the best flowers I ever received. What made these flowers so special? 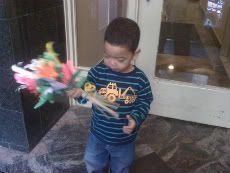 Well this is the 1st time that Daniel will give me flowers as a mother! While I'll probably gets flowers for many more years to come, this is a 1st for both us and our special moment. Each mother's day I'm reminded what I went through to be his mother. Being a single parent isn't easy and many choose not to be one. I totally understand them since some days as a single mom are downright hard. But I made my choice and each Mother's day I'm reminded that choice is still the best choice I ever made. After months of ignoring the signs I'm finally ready to face the potty process. Notice I said I'm ready and not my son. Daniel has been ready for a bit now. Matter of fact he's been spying on me and has learned a lot of the potty process. He knows after you seat on it, you get toilet paper, throw it in the toilet and pull the little handle. Great fun! 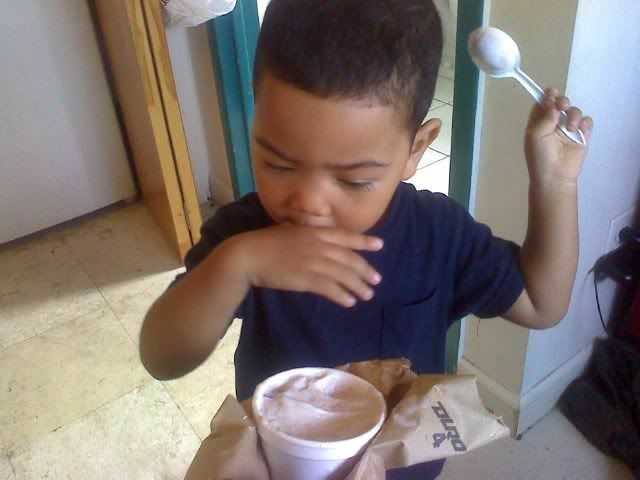 Now I didn't directly teach him this, nor do I know when he figured it all out. The way I found out he knew the system was after seeing him sneak into the bathroom, tear off toilet tissue, drop it in, close the toilet lid and flush. He was so proud he got to do everything before mommy "caught" him. 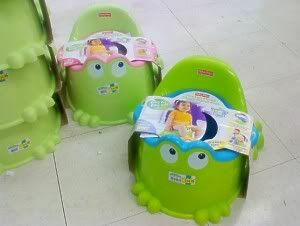 And so that brings me to my activity for today...getting him a potty so we can "officially" start the process. While we've had test runs sitting on the big toilet I think it would be easier for him...and me...if he had his own potty and can go when he wanted to. As I walk into the potty section I noticed the potties now come with "options", special features and come in styles. 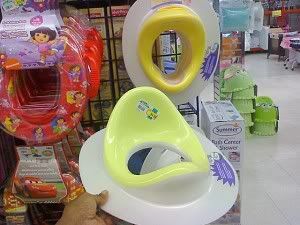 I stood there debating if I wanted a potty attachment for the big toilet or if it's better to get a child's potty? Do I need one with a special lip for boys so there's no outside splashes? Do I want a potty with a plain design or a special animal/character look? I got such a headache trying to figure it all out. Honestly, I became over whelmed about picking a potty. I couldn't figure out what he'd want or need to make this process easier...for both of us. After a bit I decided I needed to do more research and then try to tackle this potty buying on another day. 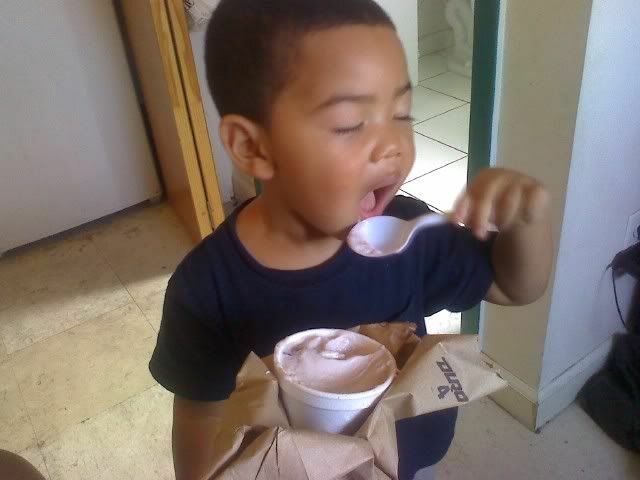 It was so hot over the weekend so we got some ice cream as a treat. 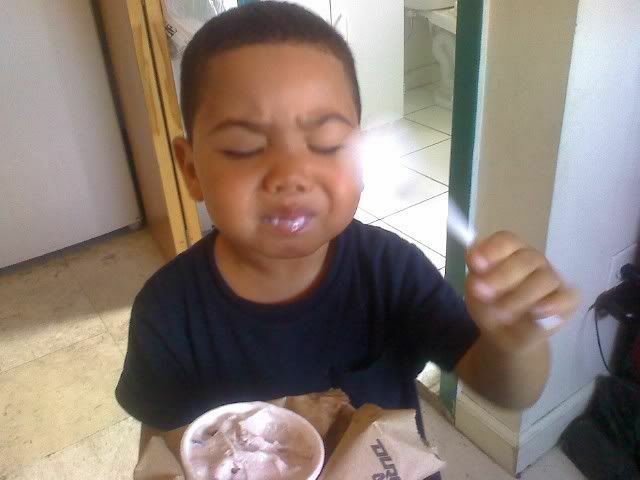 It was fun to watch Daniel eat ice cream.